Many dog parents feed dog foods that contain fish or fish meal, and use fish as an ingredient in dog treats. But is fish for dogs safe? How about mercury contamination? What kind of fish can be safely fed to our old dogs? Read on and find out. Fish, especially fatty fish such as sardines, tuna and salmon, are nutritious and contain essential fatty acids that we all (dogs included) need. More and more dog foods and treats use fish (meat and/or meal) as the main protein source. But at the same time, many of us are wary of the high mercury levels in some fish. We wonder if in fact it is safe to feed fish to our dogs, especially our old dogs. Would the toxin levels put extra burden on the dog’s liver? Fatty fish such as salmon, tuna, and sardines are rich in Omega-3 fatty acids, which have anti-inflammatory and antioxidant properties. As such, many doctors and vets believe that fatty fish can have anti-cancer effect. Feeding fish to dogs can help reduce the risk of canine cancer. In addition, fish, as well as fish oil, can improve a dog’s hair coat and skin conditions. Omega-3 FAs may also be able to strengthen a dog’s overall immunity and health due to their antioxidant and anti-inflammatory properties. Fish is also a good source of vitamins B and D, as well as trace minerals. Dogs need animal proteins to thrive, as animal proteins are more readily digestible than plant proteins. Fish is one source of animal protein for dogs. 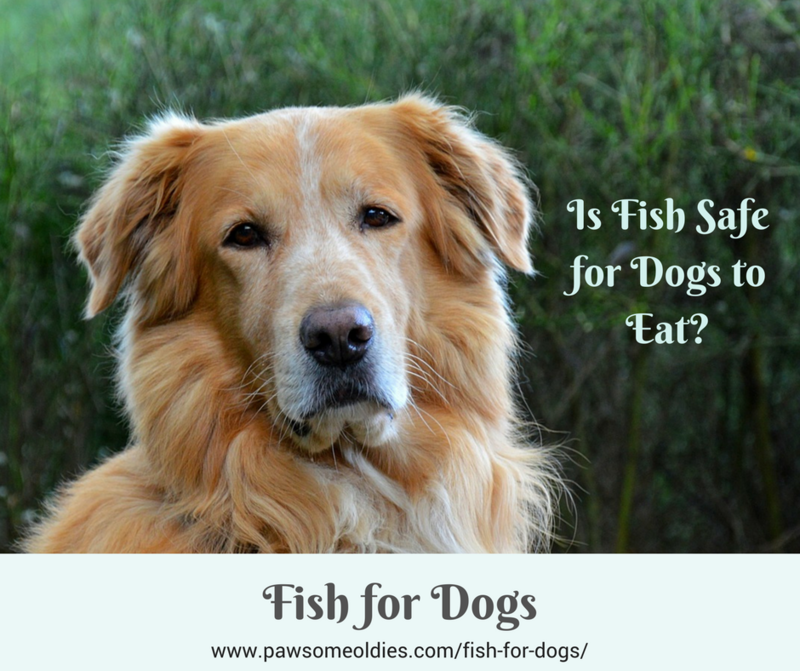 Before we go and grab that bag of dog food that contains salmon meal or add tuna to our dog treats, we need to understand some of the risks associated with eating fish. The bigger the fish and the longer it lives, the higher the risk. Why? Because over time the fish will accumulate more and more toxins in the body, making bigger fish (e.g. tuna) more toxic. Another risk is the presence of ethoxyquin in dog food products that contain fish meal. Ethoxyquin is a chemical preservative banned for human use (except for very minute amounts to preserve spices) because it can cause cancer. But this same chemical is used to preserve the fat in almost all fish meals used in pet foods during the manufacturing process. Even if the label on your bag of dog food or treat does not list ethoxyquin as being used as a preservative, there is no guarantee that the food or treat does not contain ethoxyquin. The thing is, if ethoxyquin is added before the fish meals are shipped to the pet food manufacturers, it doesn’t get listed on the label of the final food product. Does that mean that fish for dogs is no good and we should not feed our dogs any foods that contain fish and/or fish meal? There are several ways that our dogs can still reap the health benefits of fish. We just have to know how to minimize the risks of exposing toxins and chemicals to our dogs. The most obvious thing to do is to choose fish that contain lower levels of mercury and other chemicals. Smaller fish, such as sardines, do not live long enough to accumulate high levels of toxins in their small bodies. So, for example, canned sardines packed in water is a good choice. How about tuna? Should we give up on this fish totally? We can still give tuna to our dogs once in a while if we choose the less contaminated one. According to the guidance from EPA, a safer choice of tuna is the “canned light” tuna. Children under six can eat up to three 3-ounce portions per month. Older children and adults can safely eat it once a week. While fish is a good animal protein source, it is not the only source. So, another sensible way to minimize the risks of contamination is to rotate the protein sources. Feed some fish to your dog occasionally for their rich Omega-3, but feed other meat and protein sources as well. Rotating the protein sources also minimizes the development of food allergies in dogs. If you are using a dog food that contains fish and/or fish meal, and the dog food label does not specifically indicate that the food is ethoxyquin-free, call the food manufacturing company to find out. If they cannot give you a definite answer, change the food! Fish can be fed to dogs occasionally as a source of protein and Omega-3s, but do not rely only on fish for these sources. Rotate the protein sources often and, if you choose not to feed fish to your dog at all, consider giving your dog a supplement of Omega-3 fatty acids.